United Yacht Sales New Jersey would love to guide you through a personal showing of this 55' Sea Ray 550 Sedan Bridge 1995. 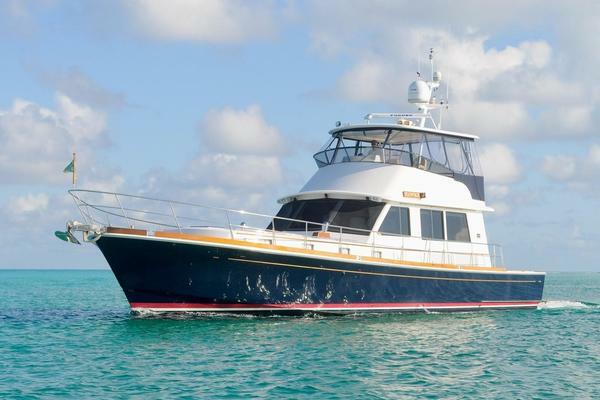 This yacht for sale is located in Punta Gorda, Florida and priced at $175,000. For a showing please contact us by filling out the form on this page and we will get back to you shortly! The Sea Ray 550 Sedan Bridge combines the performance and advanced styling of a Sedan Bridge with the spacious and elegant liveaboard accommodations of a 55-foot luxury yacht. The 22-foot flybridge offers seating for eight. The large bridge features an advanced bridge control station, snap-in carpet, an adjustable captain's chair, and two companion helm seats. Additional seating is found on the bridge bench seat, near the bridge entertainment center, which is complete with an ice maker and stereo. From the flybridge, the fiberglass companionway provides wide, non-skid textured steps to the cockpit area. Through-bolted stainless steel grab rails ensure an extra measure of safety. In the cockpit, guests can relax in upholstered aft corner banquettes, separated by a center transom door that leads out to the swim platform. From the cockpit, a large glass sliding door leads to the cabin featuring 66-ounce Masland carpeting. To port is the entertainment center and a comfortable easy chair. To starboard, a 10-foot wraparound sofa provides seating for several passengers. The sofa will also serve as comfortable sleeping accommodations for two adults. The galley comes complete with a three-burner cooktop, microwave - convection oven, refrigerator - freezer, and lots of counter space. To port, meals are served amid a spectacular view. Forward and down three carpeted steps, lie the staterooms. The spacious master suite includes a full-size island bed with custom coordinated linens, and plentiful storage underneath. Multiple storage lockers and shelves, a large mirrored vanity with storage drawers, and a private head with vanity and shower complete the stateroom. Directly above the bed, a screened translucent deck hatch provides natural light and fresh air, as desired. To port, the crew quarters provide comfortable sleeping for two. The berth also includes a washer - dryer, convenient to both upper and lower decks, as is the central vacuum system. The guest head is also portside, and includes a vanity and shower. In the starboard stateroom, guests enjoy a full-size berth with storage lockers underneath and overhead, a convenient vanity and cedar-lined hanging locker. (1) The port engine has39hours since over haul(2) the starboard engine has28 hours since over haulThere is a complete set of servicerecords forthe entire boat and engines.